Shearer's have undergone yet another re-packaging process. They have re-positioned a number of flavors under a 'Savory' banner. This design is just as striking as the broad black sided bags that are now under the Kettle Cooked section. Each of these flavors have a dark green top and bottom with a color coded flavor sitting broadly between. 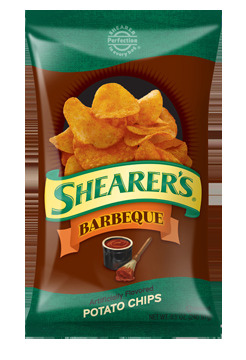 The name and flavor are given due prominence, there is a good solid graphic image and the Chips are on display. Nothing to fault, everything to praise, except for one thing - We would have gone for a dark red rather than brown, which isn't a particularly welcoming color for food. These Chips were crispy and tasty. They provided a light, crumbly crunch which turned a handful into a crackling mouthful of mushy potato very quickly. A pretty standard looking Potato Chip. There was little oil visible but there were some greasy areas. There was a nice liberal coating of brownish red seasoning in different quantities over the Chips, but most were fairly thickly seasoned. There were some slightly browned areas on some Chips. These Chips seemed a little salty at first, but a sweet, almost syrupy barbecue flavoring did kick in to take over. They remained fairly sweet barbecue for the remainder of the bag. They were not hot at all, which would disappoint some, but they were a really quite enjoyable barbecue flavor.